Japanese Bobtail cats are domestic cats that have the cutest bunny-type pompom tails. They are not tailless cats. 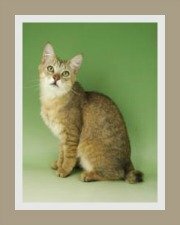 The short tail is due to a genetic mutation caused by a recessive autosomal gene. In the early days, it was believed that the Manx Cat and the Japanese Bob were related. 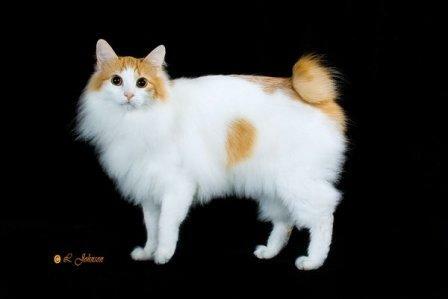 This has been disproved, the mutation that results in the tailless Manx is a separate mutation. 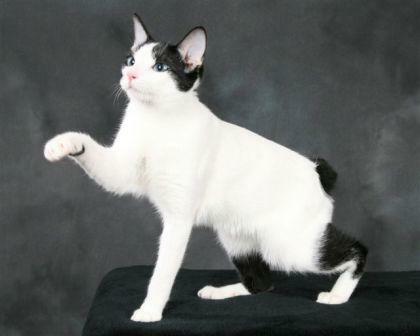 The Japanese Bobtail is a medium-sized cat with well developed muscles. It is slender and lean and certainly not flabby. Its legs complement the body and are strong, long and slender, but not delicate or fragile. The tail is its signature trait. Each cat has a clearly visible and unique tail - it can be curved, angled or straight. The bone in the tail is rigid and strong except for the base of the tail. The hair on the tail grows outwards in all directions and creates a pom-pom or 'bunny tail'. When fully extended the tail can be 4 to 5 inches (10 - 13 cm) long. 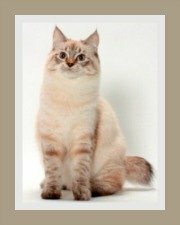 The Japanese Bobtail has a triangular-shaped head, high cheekbones, broad muzzle and a long nose which in profile, has a gentle dip in it. Its ears are quite large, set wide apart and they do tend to tilt slightly forward. Eyes are large, wide-open and oval in shape and set at a slant. Eye color must be deep and vivid and correspond to coat color. Eye-color ranges from blue, green, odd-eyes and copper. 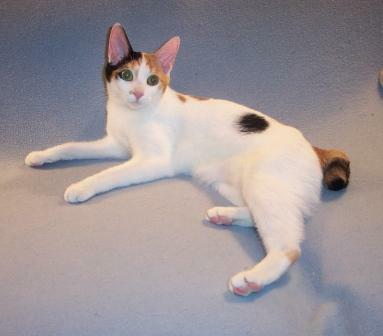 Whilst Japanese Bobtail cats come in a variety of colors, the most sort after are the Bi-color and Tri-color cats. The Mi-Ke is a tri-color consisting of black, reddish-brown and white and is the most prized color. Irrespective of pattern, all colors must be clear, even and well marked. 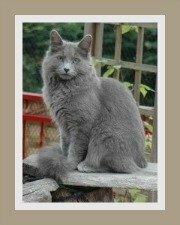 They have medium to short coats, with no noticeable undercoat. The hair should be soft and silky. They have semi-long coats, with no noticeable undercoat. The hair should be soft and silky. The hair lies close to the body and they generally have ear and toe tufts and a frontal ruff. Japanese Bobtail cats are outdoor cats. Outdoor does not mean roaming the the neighborhood, but rather an safe, escape-proof garden or cat run. Whilst they can adapt to apartment living, it is important to prevent boredom. Creating an adventure zone for your indoor cat is a must. By this we mean an area filled with toys, scratching posts, cat gyms and areas to play hide-and-seek. A single cat is a lonely cat, so do consider having two for company. Yes. Smaller children do need to be taught to be gentle with kittens and adult cats. Cats should always have their hind legs supported when held. Yes - spayed/neutered cats get on well with all pets, cats and dogs. It's always best to supervise the introduction of a new pet. Do it gradually so that none of the pets feel threatened. Japanese Bobtail cats are not for someone wanting a docile lap cat. These are active cats that love exploring and are curious about their environment. They are lively, sociable extroverts with strong personalities. You will never be lonely with one these cats as a companion. They are very 'talkative' with a wide range of scales and tones in their voices. In many ways they are quite dog-like. They love to carry toys in their mouth, play fetch and most of all they love to splash in water. Whilst they could be described as very independent, this does not mean they don't need company. To the contrary, these cats are loving and affectionate and they adore human company. They do not tolerate solitude. 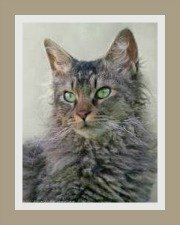 Whilst the longhaired version of the cat will require a daily brush, they are generally low maintenance cat breeds that require minimal grooming. 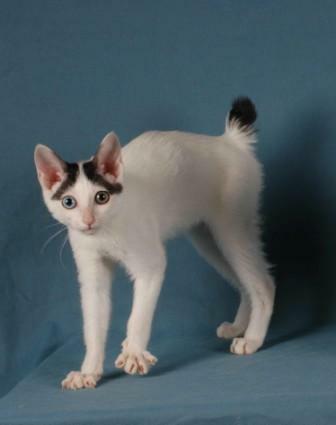 Shorthaired Japanese Bobtails are low maintenance cats. Their coats need to be brushed once a week. In Spring, they do shed more and require additional brushing. The Japanese Bobtail is a healthy cat breed. 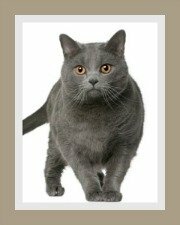 Apart from the normal preventable infectious feline diseases that all cats are susceptible to this cat does not suffer from any genetic or hereditary diseases sometimes found in the tailless cats. 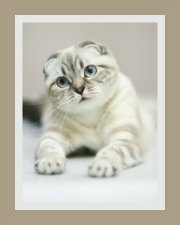 Always consider cat health insurance for your cat, you never know when it may be needed. No special diet is needed. Having said that, the longhaired version of the Japanese Bobtail may benefit from a special diet that reduces hairballs. A well balanced diet and high quality cat food is essential - you need to decide which route to follow - kibbles, raw cat food or canned cat food. Always ensure that your kitty has access to fresh, clean drinking water. They have an average life expectancy of 12 + years.